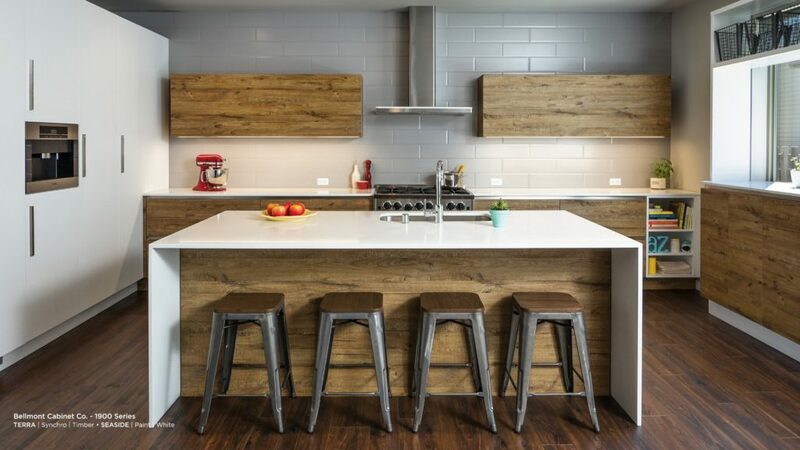 If you’re thinking of doing something to make your kitchen look a little brighter or more modern without going thru a full kitchen renovation replacing kitchen cabinet doors might be a good option. Replacing just the doors and drawers can work in some situation but much of the time a complete kitchen reface makes more sense. This refers to changing only the doors and drawer fronts of your kitchen cabinets. The face frames, toe kick, cabinet sides and cabinet trims would all stay the same. While we have replaced doors on some kitchens we don’t often recommend it because matching the color exactly is difficult. Also, once you place new doors next to old trims and face frames you may start to see how worn and dingy the rest of your cabinets are. If you happen to have frameless cabinets it may make sense to just replace the doors and drawer fronts. Refacing a kitchen means replacing all the doors, drawer fronts and trims. We also skin the face frame and cabinet boxes with a 1/4 inch panel so that the entire visible part of your cabinets are new. In most cases refacing the entire kitchen is a better choice. 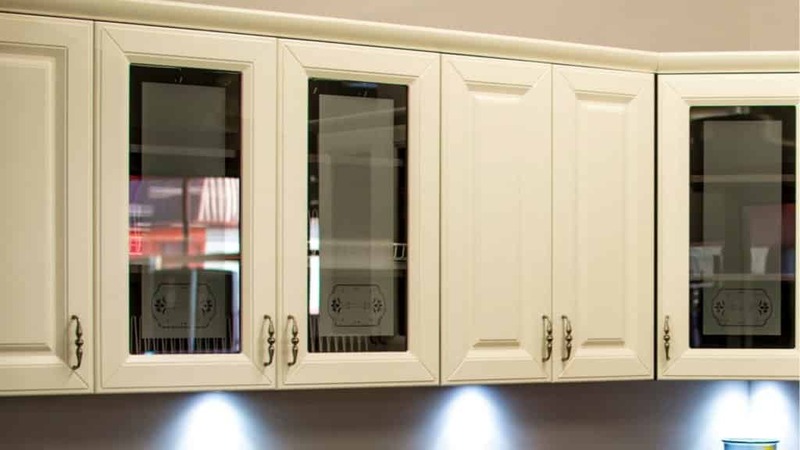 Whether you choose to just replace the kitchen cabinet doors or reface the entire kitchen choosing your cabinet doors is an important first step. In the rest of this post we’re going to talk about what to look for when choosing cabinet doors. Color is usually the first thing people look at when choosing new cabinet doors. Of course color is important but since almost any door can be made in any color I think it makes sense to first look at door construction. When considering the construction of a cabinet door it’s important to think about three things: the type of wood, quality of finish and the style of construction. Kitchen cabinet doors can be made of any kind of wood. 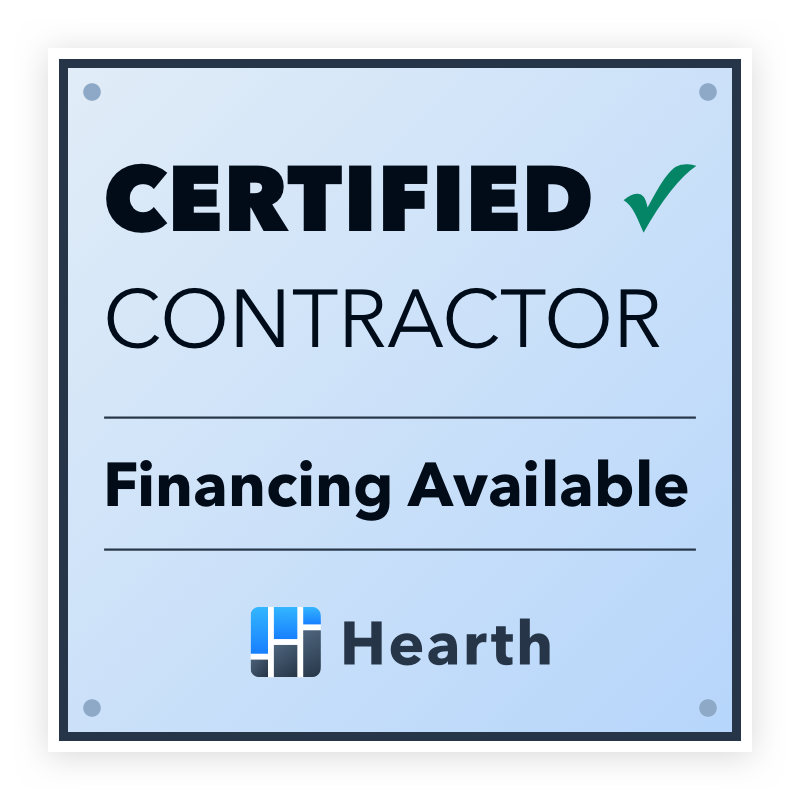 Cheaper doors are made from softwoods and more expensive doors are made from hardwood. Different hardwoods have different grain characteristics that can play a part in the look fo the doors. A lot of low cost import cabinet companies (most RTA cabinets) will use softwoods like poplar or rubberwood for their doors. They look great in the showroom but may not hold up to long term wear and tear. MDF (medium density fiberboard) is a type of particleboard used in many types of construction. It is very stable, water resistant and provides an incredibly smooth surface for paint. MDF doors are often made from one piece but better quality companies also make 5 piece MDF doors. MDF doors are only good for painted finishes. They can not be stained. MDF is used mostly for simple door styles, like shaker or a simple raised panel. In general maple doors are good for painted finishes. Maple doors can be stained but the wide grain does not take stain well. MDF doors are replacing maple as the preferred material for painted doors in certain door styles. Maple doors are still better for complex door styles with applied moldings of unique profiles. Oak is a hardwood known for is deep grain and strength. Natural stained oak doors were popular for years but many people consider them outdated today. Rift Oak or Quarter Sawn Oak has a straight grain that is popular today, especially when combined with a multistep glaze. Painted oak doors are becoming popular and have a kind of french country look to them. Cherry is one of the most popular woods used in doors with a stained finish. Many people think cherry is a red wood but in fact it’s a medium brown color but is often stained red. Cherry is known for its dramatic grain patterns. Alder is a very common wood species in the NW united states that is gaining popularity all over the country. It stains well and has a very minimal grain pattern. Black walnut, Sapele, teak, mahogany, zebrawood, ebony etc… There are many exotic woods to choose from if budget is not so much of an issue. The quality of cabinet finish can be very hard to discern to the untrained eye but very important to the long term look of the door. 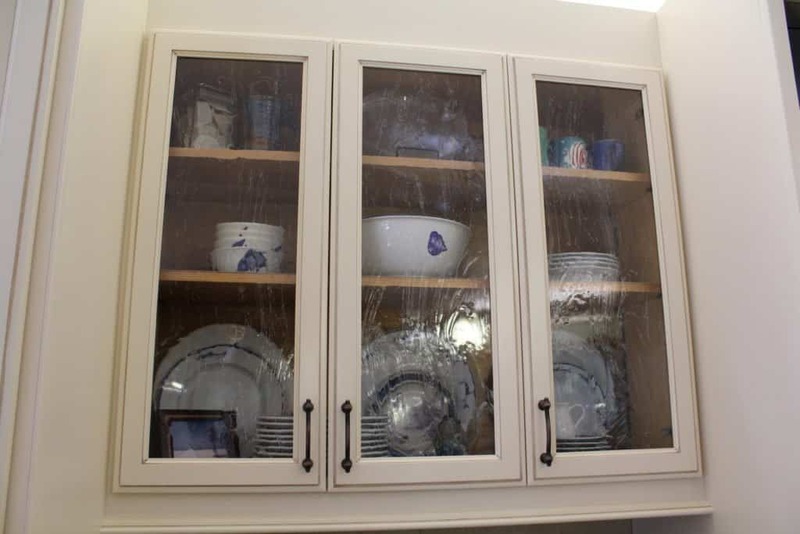 Better cabinet companies are using UV catalyzed lacquers and a mechanized flat spray system that provides a very durable finish. Small custom cabinet shops are often just spraying their doors with a hand sprayer in a small rooms at the back of the shop. Less expensive import cabinets use thin finishes that look good when new but may deteriorate quickly. High quality manufacturers and custom shops will offer a wide variety of single step and multistep glazes to enhance the look of a door. Glazes can add 15% to the cost of a door but they look fantastic. There are 3 main types of construction: Cope and Rail, Mitered, and slab doors. 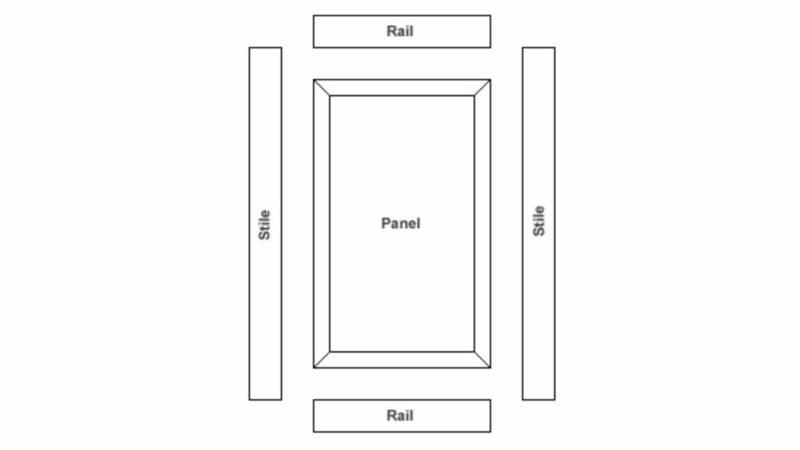 Cope & Rail and Mitered doors can come with a recessed panel or a raised panel. 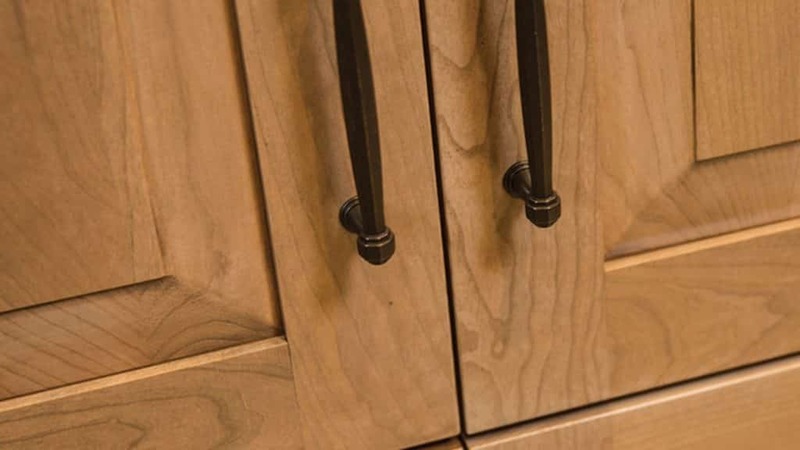 One of the most popular types of cabinet doors is the cope and rail door. This means that the door is made up of stiles and rails. 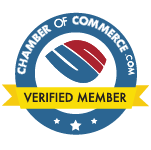 In some places, this is also called frame and panel or cope and style or even raised and flat panel construction. The cope and rail create a vertical joint at the 4 corners of each door. The rails are the horizontal parts of the wood that sit atop the cabinet door and drawer fronts, and styles refer to vertical parts down each side of a cabinet door. The rail and stile are ‘coped” at the joint, the profile of the rail is routed to match the profile of the stile. It creates a strong joint that also allows for movement in the wood. In the center is the panel. The panel floats in a groove routed into the stile and rail. This allows for the wood to move and keeps the door from warping. Mitered doors are known for their elegant design aesthetics and craftsmanship. The corners of the mitered door or drawer front are set at a 45-degree angle (kind of like you’d see on most picture frames), and they are usually locked together with some type of spine or joint (typically a mortise and tenon joint). It’s important to make sure that you pick a good quality mitered door and drawer front, ideally one where the joints are strongly joined both precisely and smoothly. In Part 2 of this series we’ll talk about things like hinges, molding, detailing, and decoration.